The news made me lose my mind with excitement, but I couldn’t help but feel hesitant. Metroid has taken some strange twists and turns in the past ten years. I’m hopeful, but, much like Samus, I shall observe my surroundings and proceed with caution. Just kidding. I’m gonna leap right into the lava without a Varia suit. The galaxy is not at peace, and I can’t wait to find out why. Nintendo has only announced a title and nothing more, but the title alone comes as a surprise. No one actually expected another Prime story. At the end of 2007’s Prime 3, Samus did not leave behind any major narrative loose ends. In terms of the narrative timeline, Prime 3 happens before the events of Metroid II, so these two announced games could end up being narratively linked. What does Samus do after she defeats Dark Samus but before she gets enlisted to mop up after the Bermuda System mission? Presumably, Prime 4 will tell us. Prime 4 signals a welcome return to form for 3D Metroid fans. 2010’s Metroid: Other M was also a 3D Metroid game, but it was a controversial addition to the series. It was more linear and less exploration-focused than a typical Metroid, forcing Samus to look at specific sections of rooms in order to cue up cut-scenes and concocting a series of narrative reasons to delay the implementation of her various power-ups. The game felt restrictive as a result of those choices, whereas the Prime games at least felt like a spiritual sister to the original 2D Metroid games. Metroid Prime games are long, thoughtful, first-person adventures that put you behind Samus’ visor and invite you to wander and solve puzzles by observing your surroundings. I’d like to see a version of Prime 4 that allows for the option to use the Switch tablet to look around, but I’m one of those rare people who actually enjoyed the wiimote motion controls for aiming and looking around in Prime 3. Nintendo has the freedom to make Prime 4 as experimental, lonely, and slow as they wish, because they’re also satisfying the other big demand from Metroid fans: bringing back 2D sidescrolling Metroid. I enjoy Metroid II, but it’s definitely not the most popular 2D Metroid game. Much like the very first Metroid game, Metroid II struggles to differentiate the areas that Samus must explore, so it’s easy to get lost. Metroid II lacks the vibrant colors that would help paint a varied picture of different areas, because it’s on the ol’ monochromatic Game Boy. My least favorite part is the Metroid II soundtrack. It pales in comparison to, say, Super Metroid’s, whose score does just as much work as the game’s visuals to characterize in-game areas. Metroid II introduced the idea of metroids being able to alter their appearance based on the makeup of the planet they’re on. Most of the time, the metroids in Metroid II don’t look recognizably metroid-y. They keep evolving into little alien dragons and bug-like creatures. Yes, Samus is still fighting metroids, but they don’t necessarily look like metroids, which only plays into the larger problem of how nothing in the game pops with recognition or memorability. This 3DS reimagination of the game gives us the color pop that Metroid II deserves. Samus Aran’s bright armor contrasts with the lush darkness of SR388’s caverns. The metroids finally have their characteristic neon glow; no matter what form they take, they still convey the visual language of metroid-ness. It helps tie the game together and remind us that this is a game about, well, metroids. Mysterious shifty li’l metroids, but recognizable metroids. 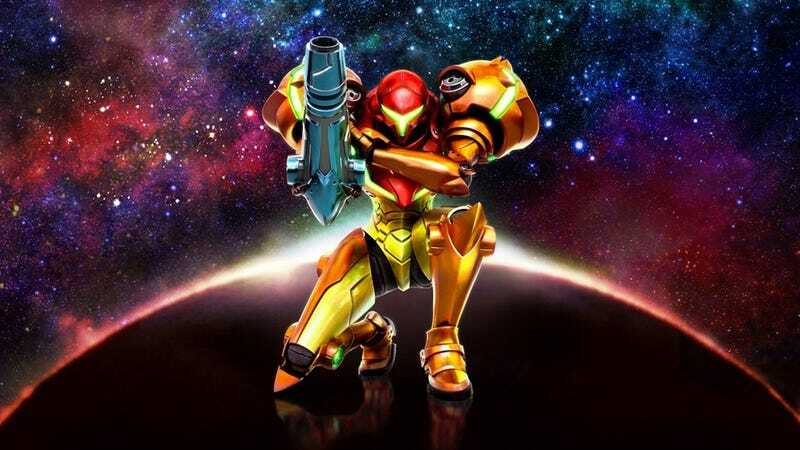 Best of all, at least for me, is that Nintendo has enlisted the composers from Super Metroid to swoop in and rewrite the soundtrack for Metroid II. This is a game that badly deserved a new look, better music, and even some cool new abilities for our heroine. But it’s bittersweet, too. This game has deserved a remake for so long that Metroid fans have already answered the call themselves. Project AM2R, a fan-made remake of Metroid II that took six years to make, got a C&D from Nintendo last year, right after putting out a full release. Project AM2R did all the things you’d want a Metroid II remake to do, like adding beautiful colors to the game, giving Samus some new abilities inspired by other Metroid games, and creating a completely new soundtrack. Except, uh, now Nintendo is also doing those things for Metroid II. Officially. Yay? I’m sure this has been a very frustrating day for the Project AM2R folks. I mean, I never expected Nintendo to actually remake Metroid II. I also never expected them to put out another Prime game. I’ve focused a lot so far on the mechanical delights I expect these games to provide and how excited I am to explore new planets as Samus on Nintendo’s latter-day consoles. But really, my reasons for feeling so excited for these games are based in nostalgia and emotional attachment to Samus. To me, Samus’ journey in the Metroid games represents self-sufficiency and resilience in spite of loss and loneliness. Samus is a woman who works alone, lives alone, and survives mission after difficult mission. She does not always do the right thing. Most of the time, she messes up and has to backtrack to retrace her steps, observe, and reflect. Samus has a solitary job, but she’s suited for it—in a literal sense, given her collection of personalized armor sets and upgrades, but also in a mental sense. She has weathered trauma and come out on the other side, still exploring and still hopeful. Well, depending on which game you play, I guess. But that’s how I’ve always seen her. Samus is also silent, most of the time. The games where Samus does speak have consistently been my least favorites. Games like Super Metroid do such calculated work at showing us, not telling us, about our heroine’s journey. In contrast, reading Samus’ diaries in Fusion just seemed like an unnecessary and intrusive shortcut. The Prime series lets us literally look through Samus’ eyes. Her struggles are our struggles. I don’t need to hear what she’s thinking. It’s what I’m thinking. Isn’t it? Super Metroid and the Prime trio have been the Metroid games that I’ve returned to in darker times in my life, due in part to the way these games allow the player to put so much of themselves into Samus’ silence and steadiness. I couldn’t be more excited to see Metroid returning to both Prime and to a Super Metroid-inspired reimagination of Metroid II.